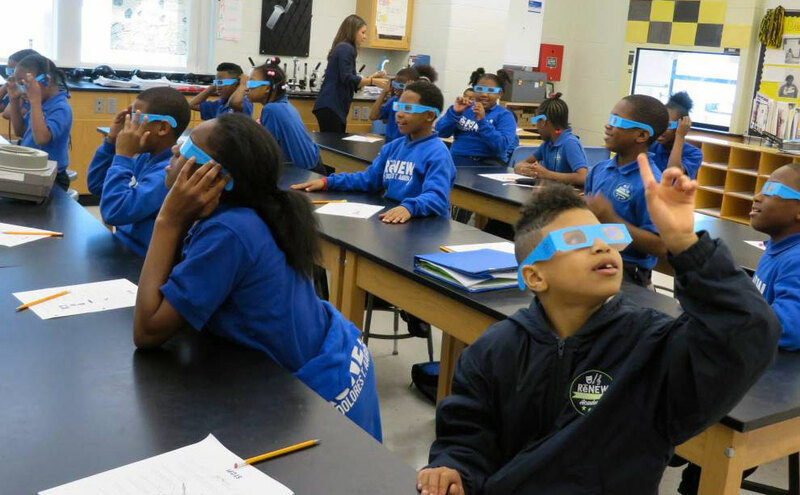 Photo provided by ReNEW Elementary – Emily Roachs fourth-grade students at the ReNEW Dolores T. Aaron Academy wear special glasses while participating in the free ‘Light & Color’ science workshop taught by veteran science teacher John Varine. More than 70 fourth-graders recently participated in “Light & Color,” a science workshop at ReNEW Dolores T. Aaron Academy in New Orleans. The students learned about how light and color are related and how their world is shaped by the light all around them. The science workshop was presented by veteran science teacher John Varine, courtesy of Pittcon, the world’s premier laboratory science convention. The workshop’s theme was chosen to commemorate 2015 as the International Year of Light. The ReNEW School event was a preview to Science Week, an outreach program of science education that Pittcon offers in each of the cities where it holds its convention. Pittcon’s Science Week kicks off on March 7 and the official conference is March 8-11 at the Ernest N. Morial Convention Center.